Agnolotti del plin, also known as ravioli del plin, are part of the filling pasta family and they’re similar to Piedmontese Agnolotti, which diversifies mostly in the shape. 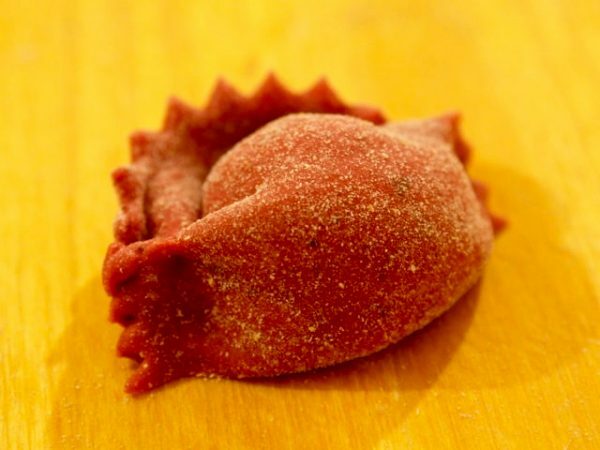 Indeed, agnolotti have a squared shape, while agnolotti del plin, typical of Langhe and Monferrato areas, are smaller and closed like a napkin pinched at its extremities (the name “plin”, indeed, refers to the act of pinching the pasta dough to create the shape). 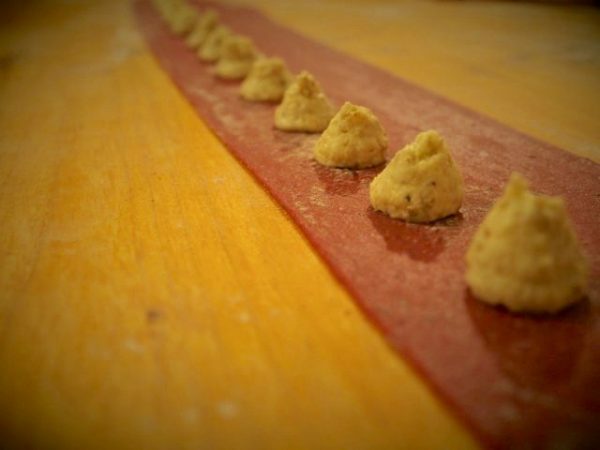 Agnolotti del Plin are typical of Piedmont, but this version with beetroot and black truffle, will bring at the table scents and colors of Autumn. Mix together all the ingredients of the filling and put it in a sac a poche. Boil the beets and, once cooled down, mix with the eggs and the flour until you have a smooth dough. Melt the butter and let it fry slightly, remove from the heat and add all the other ingredients for the dressing. Now that we have all ready, roll the dough thinly, creating som long stripes. Using the sac a poche, place a bit of filling on the stripes and fold the dough in order to cover the filling. Remove the access with a pasta wheel cutter. Press the dough between each filling with your fingers, like a nip, and cut over there with the pasta wheel. Cook your Agnolotti in salted boiling water and once they're cooked, toss them in the pan with the dressing. Now serve.